If you added items to your documents using the Elements Gallery of Office 2008 for Mac, you can remove them just as easily. You remove full-page elements, such as cover pages, a little differently from the way you remove other, smaller elements, such as a chart, table, or WordArt. To remove elements that aren’t full-page elements, such as charts, tables, SmartArt Graphics, and such, select the element you want to remove and press the Delete key on your keyboard. The easiest way to remove a full-page element is by using its shortcut menu, represented by the little dog-eared page icon with a triangle. Click this icon and choose the Remove menu option — in the figure, it’s Remove Cover Page. Choose View→Publishing Layout and then choose View→Navigation Pane. 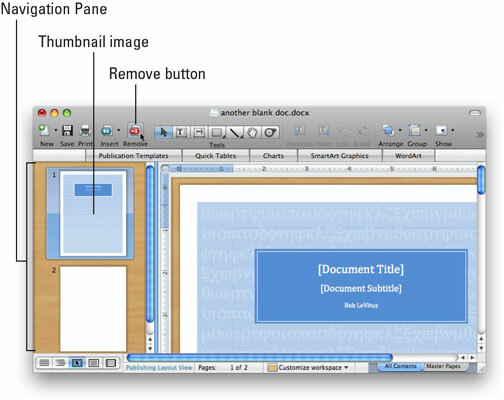 The Navigation Pane appears on the left side of the document. Click the thumbnail image that represents your element. Click the Remove button in the Standard toolbar.